A mini-submarine designed to help rescuers bring members of a soccer team and their coach out of a flooded Thailand cave was tested over the weekend in a Southern California high school pool. SpaceX and Tesla CEO Elon Musk tweeted video of the tests at Palisades Charter High School. The small escape pod was built and designed in about a day, then placed on a plane bound for Thailand, according to Hawthorne, California-based SpaceX. It was not immediately clear whether the sub will be deployed in the rescue. On Monday, dive teams had already brought out eight of the 13 people trapped in the flooded cave. Last week, Musk said he is sending engineers from two of his companies to Thailand to help with the complex rescue operation. Musk's Boring Co. digs tunnels for high-tech transport system, but also can provide ground-penetrating radar. The miniature submarine can be maneuvered through confined spaces, like the narrow cave passage, and uses a component from Spacex's Falcon 9 rocket. A SpaceX spokesperson told NBC News that the project team is in touch with Thai government officials. "Got more great feedback from Thailand. Primary path is basically a tiny, kid-size submarine using the liquid oxygen transfer tube of Falcon rocket as hull," Musk tweeted Saturday. "Light enough to be carried by 2 divers, small enough to get through narrow gaps. Extremely robust." With some modifications, the design also could be used for an escape pod in space, Musk added. 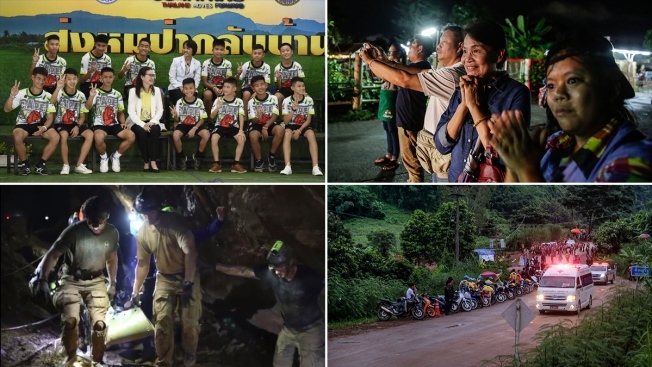 Four boys were rescued from the cave Monday, bringing the total number of rescues to eight. It was not immediately clear whether the remaining five people, including the team's coach, will be extracted in one or more operations.